Who says you have to stop riding just because the sun has gone down? Well, that’s what I used to think. Once we reached the point where we didn’t have enough evening daylight for our mid-week afternoon/evening rides they came to an end. Unfortunately so did the fitness until you started hitting the trainer. This year a club member who grew up in Philly and used to do “night riding” with her club there has organized a night ride with our group. Last week was the first one but I didn’t go. It was dark and windy. I had gotten home early enough to settle in for the evening and I would be damned if I was going back out on the bike. This week was different. I had bike commuted to work so my return trip got me home a little later than driving. I was dressed and ready for biking so I didn’t change. The ride departure was also a little earlier, which meant there was less time to settle in. It was also warmer – in the mid 50’s. I was excited and a little apprehensive, not ridden in the dark much. However, two days earlier I was out on a club ride and heading back when it was getting pretty dark. Surprisingly I felt pretty comfortable with it so I was ready for a full-on night ride. A small group met at 6:10 to head north to rendezvous with another group 15-20 minutes away and then we headed off as a larger group. There were 11 of us total with a nice mix of men and women. Everyone had at least one head and tail light on. Some of us had two, like me who had a bike mounted front/rear light in addition to a head lamp and rear light on my helmet. Many of us also had reflective clothing on, or additional items for reflection. In short, we were highly visible and I was really surprised at how much we lit up the road. I found the drivers seemed more courteous as well. I’m sure many of them were more than a little surprised to see a group of hearty, and perhaps a little crazy, cyclists out on an evening ride well after sunset. We ended up with a 30-mile route and the pace was such that we all stayed together. That’s key so no one gets dropped or left behind in the dark. Two hours later I arrived back home and thrilled about my first successful night ride and looking forward to next week’s ride with my fellow night riders. In cycling you have certain body types that are good for certain disciplines. I don’t have the body type for climbing – I’m way too bulky and short. I never considered myself a sprinter, either. I guess I thought that I’d make for a much better lead-out guy. I’d be the type that could to hard and steady for a period of time and then blow up, pulling off to allow a teammate to get a win. On our fastest ride of the week, the Saturday morning ride, we three sprint lines. The middle one is at the top of a hill – I say hill because it’s not a huge climb but enough to tax you before the sprint. The last is along a short flat stretch, after a series of rolling hills, again enough to tax the legs before the sprint. The first one is at the end of a along a flat stretch of road. The first flat sprint is the one I sometimes try for. I know there are certain people I need to mark for the sprint – not everyone goes for it but there are a few that do. I often get caught being boxed in with the sprinters making their way up the outside and others in front or to my side sitting in that prevent me from making a move. There have also been times when the legs just haven’t been there. But today I was actually feeling pretty good, even after biking all week. So I did my usual marking of certain women who would be looking for the sprint. I was behind one girl who always sprints. I lost her wheel to another woman as we got closer to the line but that wasn’t going to deter me. Linda, the woman I always mark, was feeling a little boxed in herself as the group took up the entire lane (it was much larger this year with 25 women) and crossed the line to go around the front riders and head for the line. I just accelerated with her and the other woman and then finally jumped when they did. The other woman, Cody, ended up going around Linda for the win and I wasn’t far behind for 3rd. That was the best sprint for me ever! I chose not to contest for other sprints for the remainder of the ride but did manage to stay up in the front working hard and taking pulls. With the upcoming long weekend my plan is to get in a couple long rides (50-60 miles) Sunday and Monday then my rest week begins. Taking that last rest period a couple weeks made a HUGE difference so I made sure to plan another one 3-4 weeks later. My rest week will also include a massage and a trip to Canada for the Pro-Tour races in Quebec City and Montreal. After so many miles last weekend at The Trek Across Maine, I was ready for another long ride. Today was the better of the two weekend days for it. Yesterday it rained most of the morning but I still managed to get out for our Saturday Morning Ride with 4 other women. Surprisingly at 55-degrees it wasn’t really cold, except for that time when we were caught in a downpour. I wasn’t the only one with a longer ride in mind. After a friend had emailed me we put out a blast email to any of the PVC Women that might want to join in the fun. We had 14 of us, which also included some spouses and significant. We would have had more but there were a few that weren’t able to make the 7am start. I finally feel like my fitness is returning. The nice part about so much time off the bike is that I’m not feeling that burnout that I typically feel this time of year. 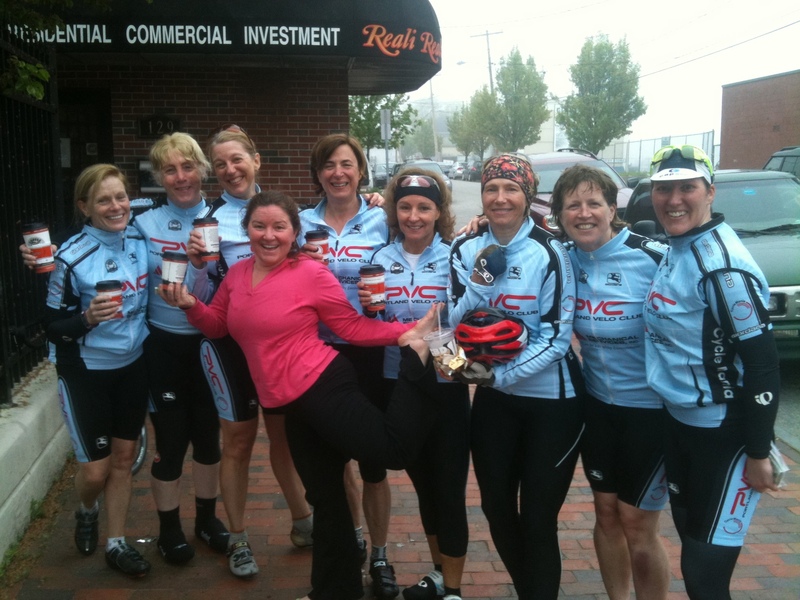 This is by far the best part about our Saturday morning rides (SMR) – coffee with some incredible women. 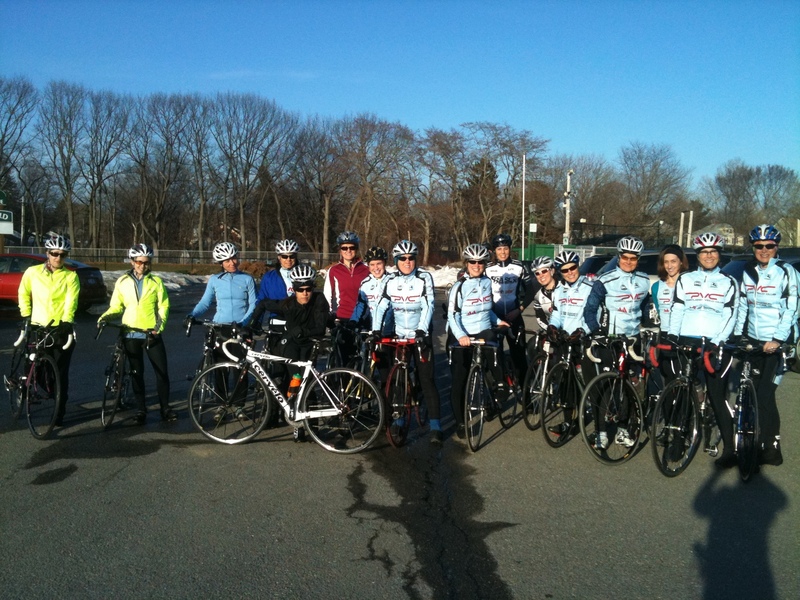 The 2011 cycling season is in full swing. Or at least as much as the weather will allow. A fair bit of rain has prevented a few weekly rides but we are still managing others. Spring weather in Maine can be hit or miss. I’ve seen 70-80 degree days in early April and also full on snow storms. Such was the case on April first this year with a good 6-inches of heavy wet snow. The up-side, if there is an up-side, to those types of storms is that the snow is virtually gone the following day. Last week we gathered for a Wednesday night ride. The afternoon was filled with glorious sun and blue sky. By the time we gathered to ride it was overcast, windy, and snow falling from the sky. But that didn’t stop the 16 or so women who showed up to ride. The adage, “If you don’t like the weather in Maine, just wait a minute” held true because about 20 minutes into the ride it was sunny and warm again. Regardless of the up and down temps and precipitation, we are officially on the road. Most of the roads have seen at least one pass of a street sweeper, so it was time to pull the Aegis off the trainer, swapping out the trainer tire for a road tire, and prepare it for the road. Yup, it’s officially spring and the biking season is upon us. We’ll still be faced with cool weather wardrobe decisions for a few weeks yet. You’ll hear no complaints from me – I’ll be outside on my bike. With a prediction of sunny skies, temps hovering around 50-degrees, and longer evening daylight, we put the word out about a mid-week ride. I expected 10 or so women. We had 17!! How freaking awesome!